I'd like to share a card I made a few days ago that was inspired by @Teamspellbinders on Instagram and their #sbspotlightsunday contest. The winner gets featured on their social media and receives some new products. A few months ago I bought a set of their Nestabilities dies, but I have been struggling to use them. The company's Instagram post urged me to use my Spellbinders products, and I am happy with the result! 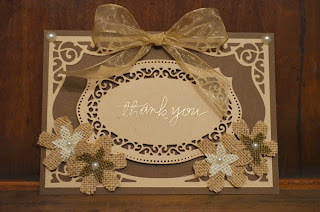 I used brown and kraft cardstock to make this rustic looking card. I used the Spellbinders Nestabilities set S5-189 to create the kraft border and center piece. I used foam adhesive to give the center piece some dimension and stamped an embossed thank you sentiment from Simon Says Stamp in the center with Ranger's Liquid Platinum embossing powder. The bottom corners feature handmade embellishments I made with burlap and a flower die from Momenta. 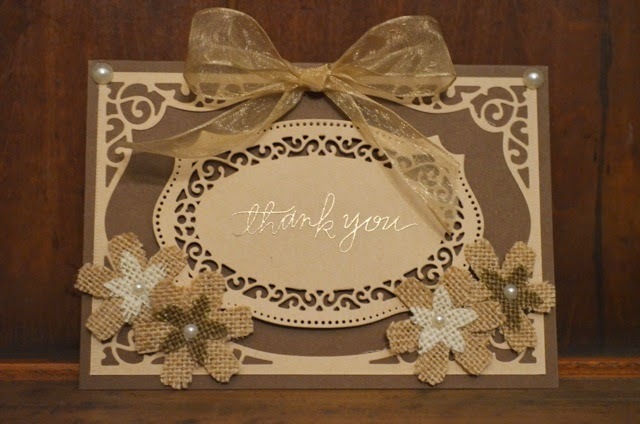 I added small pearls to their centers and larger pearls to the top left corners of the card. Situated between the top pearls is a matching bow. I didn't want ribbon to wrap all the way around the card and take away from the die cutting, so I instead had the bow tied and adhered straight to the card. Thanks for checking out my card! If you are interested, @Teamspellbinders on Instagram has weekly contests found at #sbspotlightsunday. It's a great way to put to use some of your Spellbinders products!